There ought to be clowns, tell them there HERE! 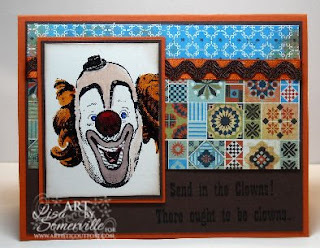 Send in the Clowns is the newest release from Artistic Outpost! All images are designed to coordinate with the Artistic Outpost Vintage Circus collection. Isn't he cute! 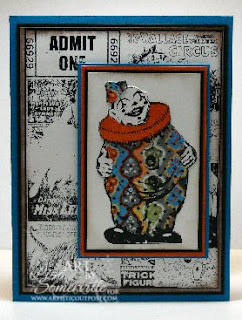 I used the Paper Piecing Techinique (Basic Grey Marrakech and Tangerine Tango card stock) to paper piece the clowns clothes. The background image is from the Artistic Outpost Vintage Circus plate, stamped in black on White card stock, then sponged with Chocolate Chip ink. Here's another cute clown image from the Send in the Clowns plate. The image is stamped in black then colored with markers. Layed on Chocolate and Tangerine Tango, then Basic Grey Marrakech Paper. The sentiments are stamped in Black on the Chocolate card stock. Special Offer on Send in the Clowns from Artistic Outpost: As a preview special, when you buy "Send in the Clowns" ($12.00) you will also get a FREE coordinating collage sheet professionally printed on card stock. This sheet features more circus images including vintage posters and advertisements. This special is good through March 25th. Click here to see more details on this release and the creative samples from the Artisic Outpost Design Team and Guest Designers! Lisa - great job - this stamp set does look like fun, I will add it to my wish list - that has been growing lately! - I was fortunate enough to get a pack of the beautiful new Basic Grey paper Marrakech from a friend of mine - and I you have hit the nail on the head with using the Stampin' Up In Colors with it - they are perfect for that set of papers. Thanks for sharing - love your work! love the cards, Lisa, the colors and layouts are just divine. really cute Lisa, I wish I could see the paper piercing in person ,I bet its even cuter up close! great samples! !